For everyone that contacted me through all type of media, thanks a lot for your good thoughts! The knee surgery of my mom has finished and we’re seeing the evolution more trying to low the inflammation. Now it’s also the stage of workouts and we hope good result soon. As you guess I haven’t had any time to write, even to publish a guest post, I’ve received. I expect to return posting something shortly. I’ve the pleasure to inform you that I’ve been interviewed by Theresa of the Half Hour Meals Team. This Food Site is full of excellent & easy recipes. Surely you’ll find a tasty recipe that will fit on your palate! Thanks a lot for the Interview Theresa! Here it’s the link of the Interview about my Food Blog. Now to the Best of the Week! Best of the Week is a series of roundup-articles published every week, touching principally themes related to food, blogging, social media and health. For more information, you can read the first article of these series. 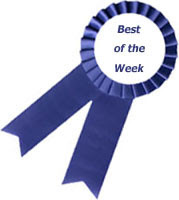 Do you want to be included in “Best of the Week” posts? The featured articles come from the return-feedback in comments I’ve from other bloggers, from the interacting on my social networks as well as of selected-articles chosen between hundreds of my RSS reader’s subscriptions to other blogs. Subscribe with a RSS reader or by email to be updated and also join me at twitter, facebook, stumbleupon, and join my blog on facebook. So what are you waiting for? I expect hearing from you! 10 Tips for Effective Marketing on StumbleUpon! Subscribe in a RSS reader or get updates by Email! Love your interview! It was great to get to know you better – and your food loves! Must be a yummy household to be in. Nice interview and good news that your mother is on the road to recovery. Thanks for the weekly links. On behalf of Nancy & Myself we wish all the best for a speedy and full recovery for your Mom. You are in our thoughts. Really great interview, Gera! Congratulations! And hopefully, you're mom is feeling better everyday. Wishing your Mom the speediest of recoveries. The therapy is very difficult – but the results are well worth it. So glad she is on the upside of surgery. Hang in there! Dark chocolate could guard against stoke, well then I am toatlly guarded! Happy to hear that mother is doing well Gera. Lovely interview. Always nice to learn about foodie friends. Have a great weekend! Congrats on the interview- that is amazing! Also glad to hear that surgery went well and recovery is in progress. Another great collection of best of week. Wish your mom will be in speed recovery and you yourself must take care too! I am so amazed at all you do Gera! I wish a speedy recovery for your mom! Peace, and hope you had a wonderful Mother's Day! A great interview! Very interesting. Thanks for the great links and for linking to my recipe! My recent post Win A Peruvian Cooking Class with Chef Alejandro Saravia! Thanks everyone for your comments and positive thoughts! As you know I read all the comments but nowadays I've little time to answer each of you individually. Thank goodness the surgery is over and now it's time to heal. You offer such great links to terrific blogs, that will keep us all busy while you go through the recovery process with your mom and catch up on all important "to-dos". Take care. Sending you sunshine wishes for a speedy recovery for your Mum, and heartiest congrats for the interview my friend. As always, I love the round up, and thank you for including me. My recent post BUTTER CHICKEN … add zest to life with curry! It's good to hear your Mom is doing good after her surgery Gera! I wish her the best. Thanks for including me in the best of round-up! Another good one. I'm so glad your mom had a successful surgery, I wish her a speedy recovery! Great list once again Gera! Gera, I hope your mom and you are well. It is understandable that you're preoccupied with other matters. Family well-being is important. Thanks for the round up. I learn so much from your social media tips. I'm going to have to try thos Toffee Snickerdoodles! Hi Gera, I see I have my reading list for this week, always great to find a treasure of wonderful posts. I am so happy to hear that your mom had a successful operation and may her recovery be smooth. Finally, what a great interview, and I learned some new facts about you and you can be sure I took notes on all that delicious sounding food. Thank you so much to include my bread in this list Gera. Much appreciated! Impressive list as usual. I am especially interested to know more about that raw food dieting.